My best friend A is lucky enough to have a family apartment at Oostduinkerke on the Belgian coast. 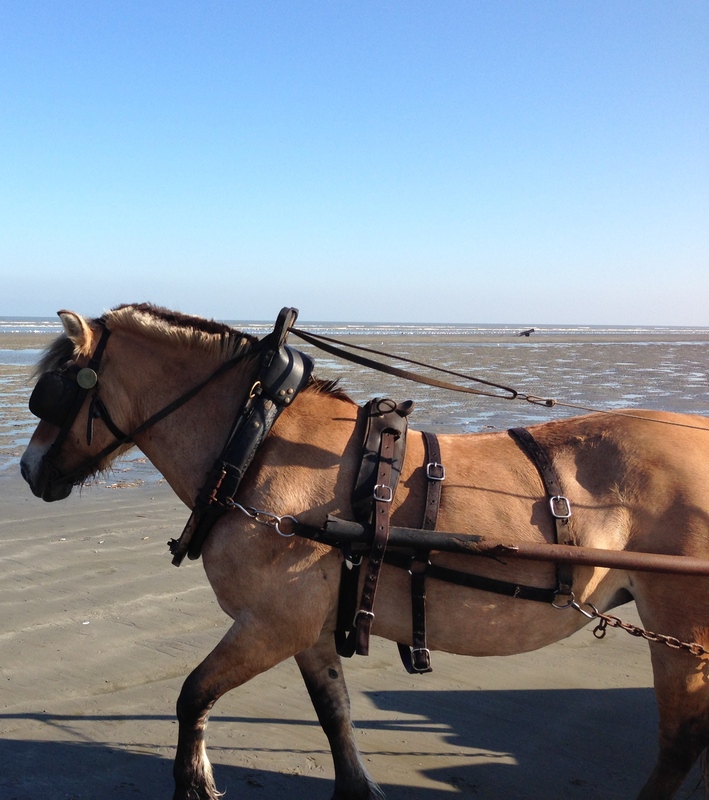 It is from A that I first heard about the dying tradition of paardenvissers, an ever-shrinking group of shrimp fishermen who still use horses to trawl for their catch. It is a tradition that can be traced back half a millennium and was once common not only in Belgium but also in the UK and France. 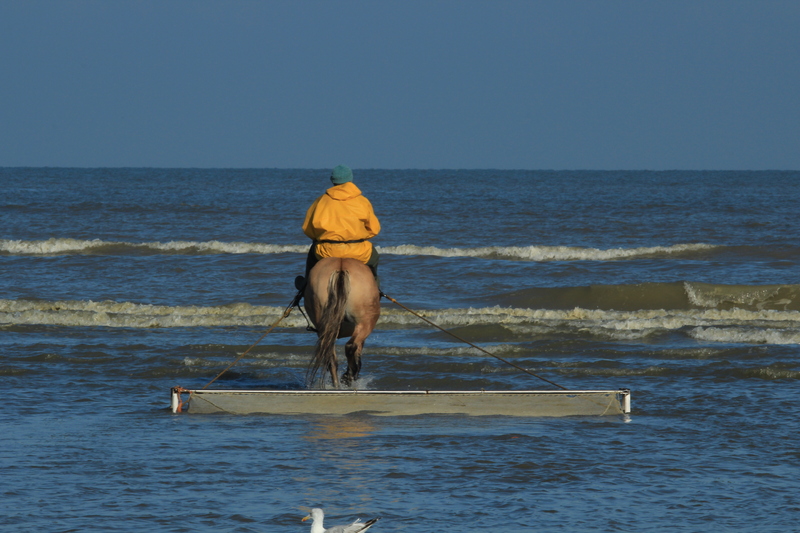 By 1968, there were only seven horseback shrimp fishermen left in Oostduinkerke, this number had risen to around twelve when they were recognised as an ‘intangible cultural heritage’ by UNESCO in 2013. Being a bit of a sucker for quirky Belgian events, seeing the fishermen in action has been high on my ‘must see’ list for some time (the Ypres cat-throwing festival is also waaaay up there, roll on May 2015). Mr B and I had checked the timetable for this summer, only to be thwarted by his departure for a year-long project abroad. Readers, the stars aligned and Mr B returned for a few days of R&R that coincided with the last outing of the season. The morning was gorgeous, one last shot at summer for this year. There is always something magical about having a day off when the rest of the world is working, isn’t there? 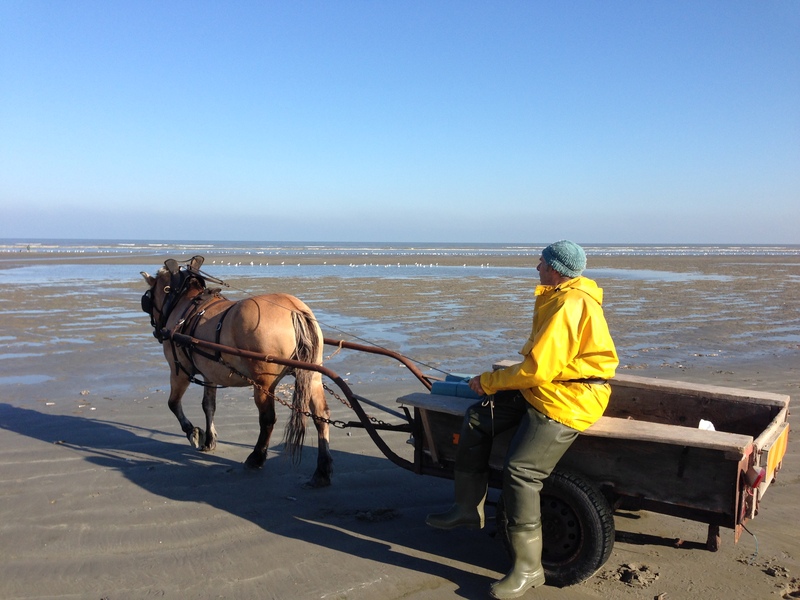 We decided to start at Koksijde, the amusingly named village just down the coast from Oostduinkerke, and strolled along the broad, golden sands hand in hand, feeling quite giddy with being reunited, albeit briefly, and the sense of pending adventures. 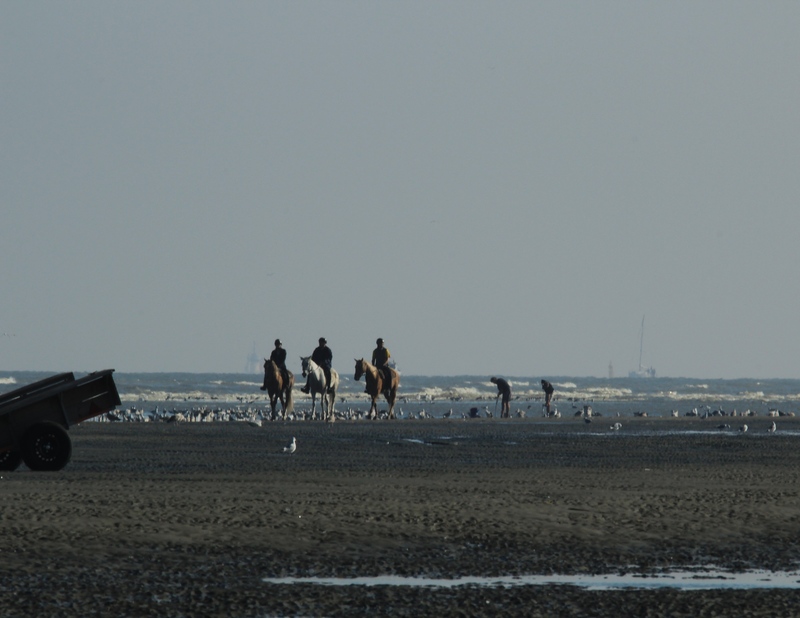 At the Oostduinkerke end of the beach you’ll be able to see a small group of the shrimp fishermen working together (Alison at CheeseWeb has a beautiful account of her visit last year here). 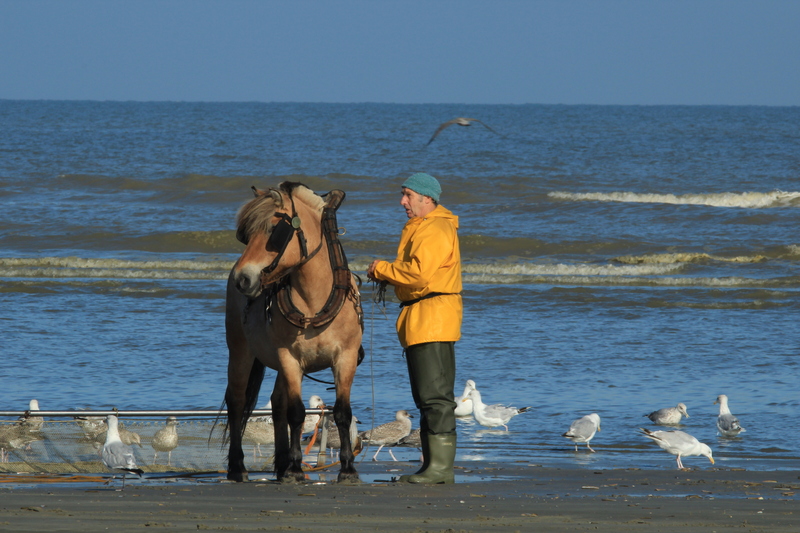 We, however, were lucky enough to stumble across a lone fisherman, well away from the crowds, surrounded only by his wife, a couple of clam diggers and shrimp fisherman working by hand…and a practically every seagull in Belgium. Paardenvisser, a rarer and rarer sight in Belgium. 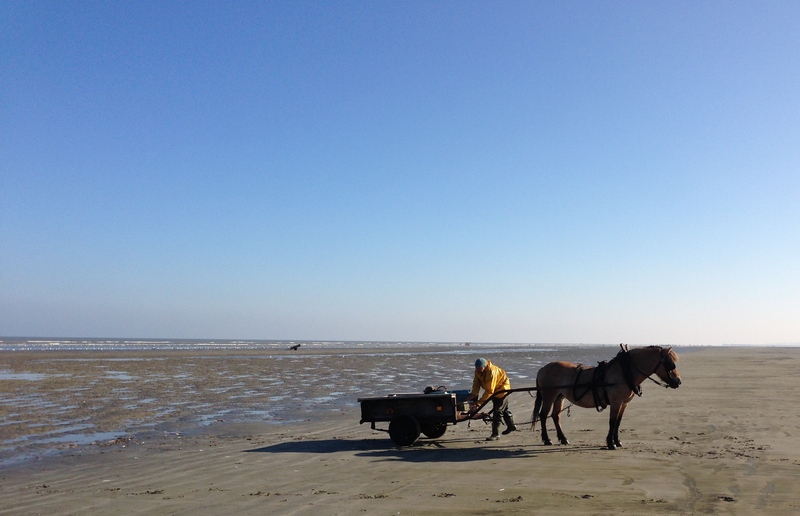 We caught the paardenvisser as he emerged from the sea after his first run of the morning, unloaded his catch for his wife to sort and went back in for a second trawl, his feet hitched up high by the horse’s neck in the traditional way. Horses scare me but this little fisher horse was a peach. So patient, and perfectly accustomed to wading along the water up to his neck, fearless in the face of the waves breaking around him. It is an incredible sight and, I can’t help feeling, a much more sustainable way to gather the tiny, grey shrimp that Belgians love so much. Mr B and I took a gamble, weather-wise, and strolled along to the inaugural Brussels Food Truck Festival this weekend. The festival coincided with celebrations to mark the 25th anniversary of the Brussels region and signals yet another step in the slow transformation of the city becoming a modern metropolis. The diabolical weather had not deterred a good crowd of mostly young residents, visitors and families from coming out to sample the various wares on offer. Mr B and I agree that it is cheating somewhat to have ‘frites’ on offer here in Belgium. That aside, the Mexican cantina attracted a steady crowd of North Americans and the Patatas Bravas truck (shaped like a potato) delighted everyone. There were bagels, thai food, soup, coffee, duck, an absolutely charming Piadina stand also offering good Italian wine and above all plenty of burgers. For a first time festival, it was a good turnout, both in terms of the number of trucks and also in terms of the level of excitement generated amongst the foodies in the city. We really hope the Food Truck Festival becomes a regular fixture in Brussels’ ever growing number of city-wide celebrations. Only next year, it would be great if the organisers could find a spot with wider pavements or arrange for traffic to be halted completely. Oh, and some dry, sunny weather would be awesome too. Well, it has been fun hasn’t it, the almost weekly to-ing and fro-ing we’ve had over the last three years? Alas, I won’t be needing you anymore. It’s time to move on. Oh, it’s not you, it’s me! A new job means my focus will be elsewhere. You’ll be fine, trust me. Something else is sure to come along. We both know you deserve better. They say the mark of a good relationship is the ability to appreciate the time you’ve spent together and take away the lessons learned. So here goes. Your newspaper and magazine collection in the lounge is unrivalled and one of the things I love most about you. You’re really very generous. I’ll miss being able to delve deeper into Belgian news and culture whilst simultaneously catching up on the latest gossip about Victoria Beckham and uncovering new eating spots in Brussels via your in-house magazine Metropolitan. You’ll be pleased to know that your sedate air has rubbed off on me. I no longer tear out pages from your magazines (shocking, I know) but capture them on my iPhone instead. And you said I’d never change. As I write, you are in the kitchen, whipping up yet another curry for us. Since our time in India they have become something of a point of pride for you. You love nothing more than playing with the spices, toasting and grinding your own mixes. I am truly lucky that you found me. That you did not give up on me during those first months when I was not available or later, when I descended into dark days and you struggled to understand what was happening and felt helpless but still pulled me through. You are a gem. The real reason I call myself ‘Remedial Wife’ is that I never feel like I pull my weight compared to the amount of love and care you provide. I’m always playing catch up. You are much more patient than I am. You see the humour in the blackest situations which threaten to swallow me whole. You call me out when I begin to wallow, having learned the signs. We pay someone to clean the house and iron your shirts because I’m not one of those wonder women who can do everything with style and panache. I am easily overwhelmed, with a tendency to throw too much of myself into my work to the detriment of everything else, particularly myself. It is your love that cocoons and protects and anchors me. It is almost Valentine’s Day. Traditionally this is one of the two (yes two!) times a year that I try to make an effort and cook for you. The dish is not going to be a surprise because I tend to fall back on the same things repeatedly but at least it is something you claim to enjoy. It is a meagre sign of my love and deep respect for you but it is a start, right? Who knows where we will end up next, my love? It is not always easy, this cycle of packing up and moving on but we both love it and you are a most excellent partner in crime for adventures. Happy Valentine’s Day my boy. When I first moved to Brussels I was lucky enough to have room-mates with an amazing eye for treasure which meant we furnished our flat for next to nothing and with a unique style. You know the type – you all go out to a flea market and you blithely walk past rows of overflowing cardboard boxes of what you consider ‘junk’, while they spot original 1950s china at 200 paces AND get it for a bargain price. I’m not a die-hard bargain-hunter. During our time in Asia I discovered that I’m just too British to be a good haggler. I find the whole exercise incredibly stressful and distasteful while Mr B revels in it. Nevertheless, when I heard about Belgium’s largest antique and flea market in Tongeren I was curious and wanted to pop along ‘just in case’. You understand that after our postings in India and China Mr B and I have absolutely no need for any more furniture but one of the great things about expat life is the ability to find beautiful things that add a certain ‘je ne sais quoi’. If, like me, you swore that this summer would be the year when you would get to Ommegang and failed (*curses work*), or that you would stroll down the canal to check out the beach and summery activities at Bruxelles-Les-Bains and failed (*curses own laziness*), you might be forgiven for thinking that you’ve missed the best bits of the fabulously quiet summer in the city. 1. Cycle: take advantage of the low levels of traffic and hire a Villo, or take your own set of wheels to see the city from a different angle. Remember this is the one time of year you will feel as if you are not taking your life in your hands by moving around on two wheels in a city notorious for traffic jams and aggressive driving. Particularly recommended are heading out to the Forest de Soignes or the 6km old railway cycle path towards Tervueren. 2. Picnic: Those of us who live here know there is a precious small window of a few weeks when we actually see blue skies and sunshine. Take advantage by visiting one of the 50 parks throughout the city. 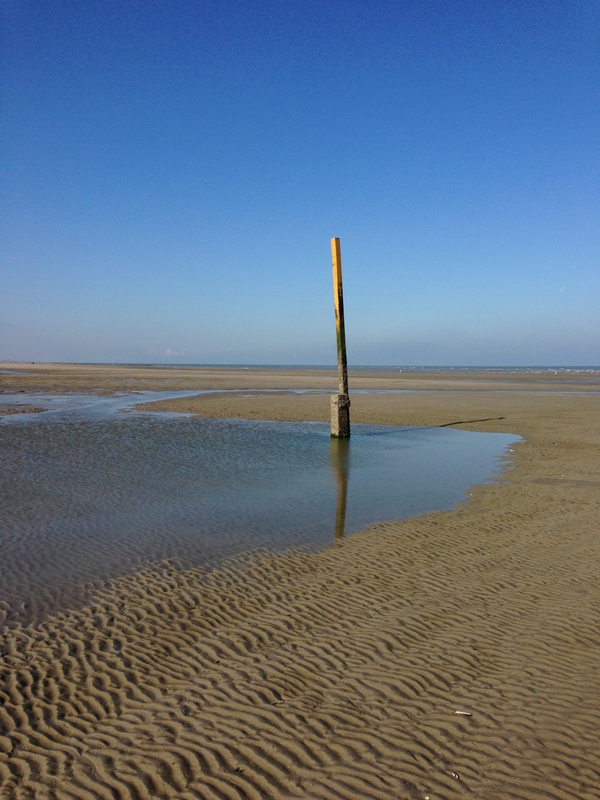 Alongside the goregeous Petit Sablon, more unusual choices include the Haren cemetary and the Cite Modele in Laeken. Pick a part of town you don’t know and explore! Another great introduction to the city’s parks come via the Urban BBQ, this year in its 7th session at Parc Woluwe on 18th August. A number of top chefs provide a delicious set of ‘tapas’ to begin plus BBQ for EUR15. 3. Royal Palace: With the low-key coronation out of the way, now is the time of year to snoop around the offices of the Belgian Royal Family. Not to be confused with the Palace at Laeken whose gorgeous greenhouses are open for a few weeks every spring, at the centrally located Brussels Palace you can see the faded glamour of the Grand Hall, Throne Room, Mirror Room (look for the beatle winged ceiling) and then pass harsh judgement on Leopold II whose ruthless exploitation of the Congo made it all possible. Open until 1st September. 4.Floralientime: A new event from 2013 to fill the alternate years between the famous, beautiful and slightly bonkers “flower carpet” on the Grand’ Place. The Floralientime fills Grand’ Place and City Hall with stunning arrangements from top florists. The inaugural theme is ‘Colours of Life’. Talented photographer Alison at Cheeseweb has, as ususal, captured gorgeous images that are guaranteed to have you rushing to pay your EUR5 entrance fee. Open 15th-18th August. 5. Brussels Summer Festival and beyond: Belgians adore music of all kinds and in the summer there are festivals galore to choose from. The biggest is the Brussels Summer Festival (9th-18th August) but there are many others, including the free Feeerrieen organised by the incredible team at Ancienne Belgique and this year celebrating its 10th anniversary in the Parc Royal, (26th-30th August). Festival Midi-Minimes offers a mini-break for your soul each lunchtime from 12.15 at the Royal Conservatory (until 31st August), L’Orgue at Notre-Dame-de-la-Chapelle is ideal for those seeking the melancholy tones of the organ (24th-31st August), Fiesta Latina will liven up the Bois de la Cambre (23rd-25th August) and Classissimo for classical lovers at the Theatre Royal (8th-17th August). 6. Midi Fair: Brash and impossible to miss, the fair dominates the area around Gare du Midi until 21st August and for many signals the official beginning of the summer in Brussels. There has been an annual fair on this site since 1885! Open until 2am at the weekend for all your spinning and swirling pleasure with the added benefit of keeping me awake. While the police are visible, be very aware of pickpockets. 7. Mini-Europe by Night: Given a reprieve following the threat of closure earlier this year and accompanying wailing and gnashing of teeth by Brussels residents, see this kitsch monument to the glory of the European continent illuminated. Fireworks and illuminations every Saturday until 17th August. 8. Arts & Theatre Festivals: Again, for a small country there is an astonishing wealth of arts in Belgium supported by our generous tax donations. Summer festivals in Brussels include contemporary performing arts to reflect the ongoing financial crisis (intriguing or up itself? You decide) at the wonderful Brigittines complex in the Marolles (I can only attest to their cafe, the rest is too highbrow for remedial wives. Open 16th-31st August) and the Theatres Nomades which looks much more jolly, especially for those of you with kids. Open 22nd-25th August. 9. Enjoy an aperitif in the sun: Formally via the Friday drinks rotating amongst parks and landmarks across the city, Aperos Urbains, or informally taking advantage of the (slightly) thinner crowds at Places Chatelaine, Flagey, Brugman, du Sablon or St Gery. Now is the time to find a table, don your sunglasses and bask in the evening rays. Sante! Antichi Sapori Italiani on rue de Bailli 73, is a great example of the many Italian traiteurs in town. This is a brilliant concept, found both in market stalls and stores such as this, perfect for remedial wives in need of fast, ready but home-made options for dinner. As well as ready to eat pastas, they sell all kinds of deli products, biscuits and wine. 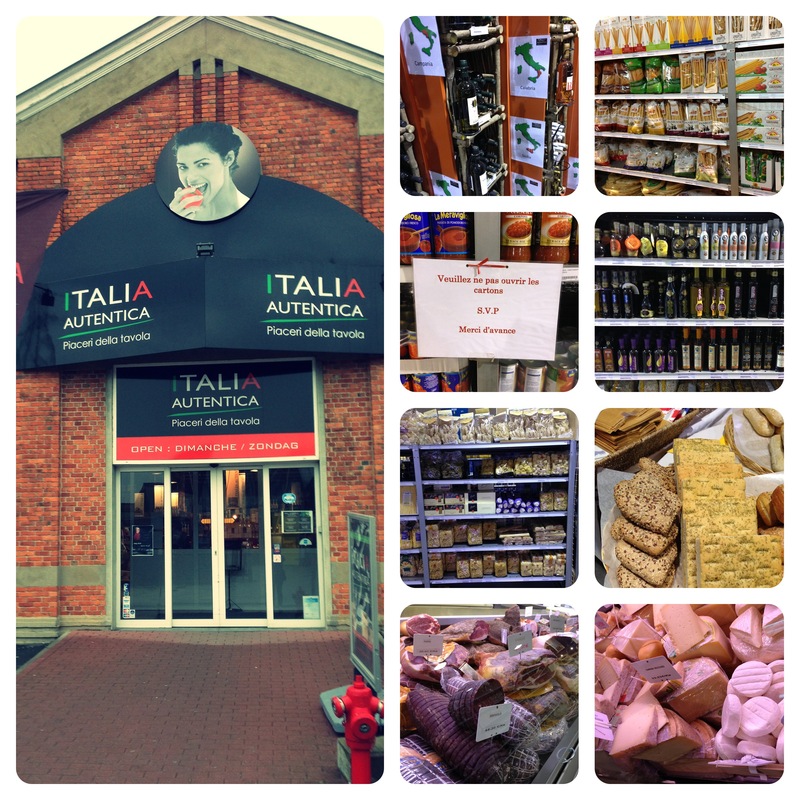 A very recent discovery is Italia Autentica, an amazing couple of supermarkets gathering products from all over Italy. The drawback are the odd locations (Mr B and I missed the one in Drogenbos by a frustrating few hundred metres the first time) but this just gives the whole process a greater sense of adventure. Be warned, these supermarkets are extremely popular so it is best to get there early. A huge wine selection from all over the country, a massive choice of dry pasta, oils, frozen foods, fresh bread and a full deli counter are on offer. Mr B highly recommends the Tuscan sausages. At Christmas, Stival Mercato on rue Vanderkindere 540 in Uccle provided lots of authentic continental treats for family and friends in the UK. A good amount of choice with a neighbourhood feel. Those in search of good Napolitan pizza (and many friends argue the best pizza in town hands down) should look no further than Fratelli la Bufala in the perennially popular Chatelain area of town. Fornostar on the aptly named Quai au bois bruler 65 near Place Ste Catherine is a favourite of an Umbrian friend who has in turn shown us that this is a great choice when you have visitors, with a wide range of exciting pizzas and the handy location in the city centre for drinks afterwards. Mr B and I also love the student favourite Dea’s pizza on rue du Germoir 3 for take aways. Osteria Romana on Avenue Louise and Toscana 21 on the Sablon come highly recommended. I’m a bit reluctant to divulge the last choice for this list, given after my first visit I realised it is one of those absolute hidden gems with incredibly authentic food and passionate chefs that can quickly spiral to the top of a “must do” list but I’m sharing it selflessly as good restaurants deserve lots of support! The fact it is normally only open at lunchtime simply adds to its mystique (although if you can rustle up a group of 10, they’ll open exclusively for you in the evenings). It is Il Ramo Verde on rue de Toulouse in Etterbeek (very obscure location but again, worth tracking down). Autumn dishes are a particular speciality – a must for truffle lovers! As a non-coffee drinker, I am only going to dip my toes into this. There are plenty of Italians in Brussels who will lament the lack of good espresso in town, while others hold the Natural Caffee on rue Breydel 50 in high estime (though not the other branches interestingly), while others are celebrating the opening of a real coffee house at the Pl du Luxembourg end of rue d’Arlon. Where do you go for your Italian fix in Brussels? Venture into the wilds of Drogenbos to find this hidden Italian treasure!